Are you looking to teach a lesson that is historically accurate on the First Thanksgiving? This is an original song that does just that! Teach your music classes a historically accurate lesson on the very first Thanksgiving celebration with Orff and drum accompaniments. Guitar or ukulele could easily be added, as well. 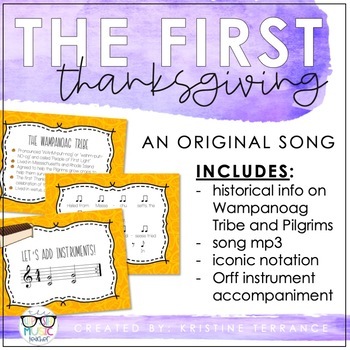 Lesson also includes background background information on the Wampanoag Tribe, the Puritans (Pilgrims), and the first Thanksgiving dinner celebration. MP3 of the melody is also included.